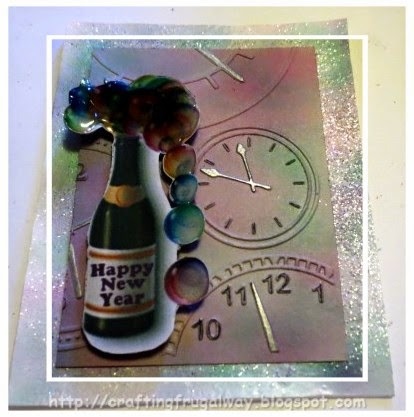 Guest Designer - Beth Wheeler - Glittered Welcome to the New Year! I love the New Year! Time to see things in new ways! So today we have a great designer, Beth Wheeler. She loves her eBrush! Thank you Beth for sharing! Happy New Year Ebrush fans. I was honored to do a guest post. My name is Beth and I’m a loving my eBrush. I love seeing what I can do with it and it has already saved me money as I can color my own embellishments whatever color I want. Not to mention that I don’t have to store a trillion different colors of card stock. The card I made using my eBrush is on a glittered background and an embossed panel. 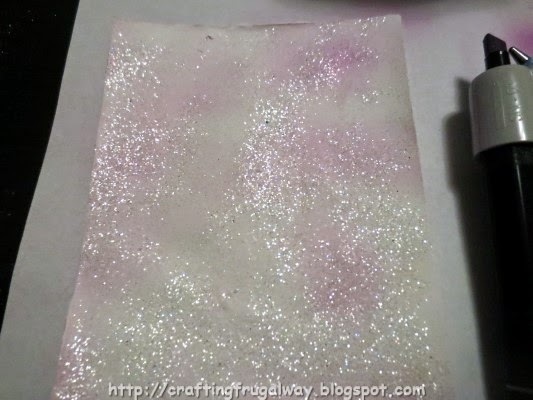 The glitter background is easy to do and would be elegant used on a wedding card or for other occasions. The image is one I found on the Internet putting in a search for free New Year’s clipart. I love how easy it is these days to find free images to use. After cutting it out with my cutting machine I used Dimensional Magic on the bubbles. Glossy Accents would work just as well if you wish to add some dimension to an image. With these products a little bit goes a long way. The embossing folder I used is one by Teresa Collins which came with my eBosser. It is actually embossed on gray card stock. I eBrushed and then used a Sharpie marker on the hands of the clocks and a colored pencil for the numbers. Card stock in the size you wish your panel to be. Any color will do since you will be covering it up. I like to use scraps left over from doing print and cuts.You will need to spread gesso on the card \stock. A pallet knife or an old credit card will work.Glitter I have only tried this technique with coarse glitter crystals. A container with a shaker top is helpful but you can always use a spice jar or a spoon to sprinkle the glitter. Of course you will need your eBrush and markers of your choice. With your tool of choice spread the gesso so that the card stock is just covered. The heavier the gesso is the longer it will take to dry. 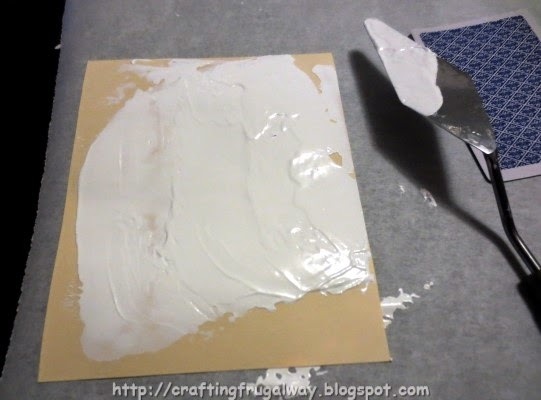 You can smooth out the gesso or leave it irregular like I did to imitate snow on a card. While the gesso is still wet sprinkle the glitter. The heavier the amount of glitter the less the color will show through. Then comes the hard part waiting for your panel to dry. I usually do things like this at nighttime as otherwise I spend all my time checking. The amount of time depends on how heavy the gesso is applied, temperature, humidity and things like that. Don’t panic if the card curls a little bit while it dries. You can either put it under a pile of books after it dries before or after you eBrush. In this case you can’t iron it flat or speed up drying with a heat gun. After the panel dries the fun begins. I used two different colors of Spectrum Noir markers. I used the lowest setting and held the brush an inch or two above my paper as I wanted a soft spray. I practiced on scratch paper first. I’ve only had my eBrush for two months so I’m still learning. I hope you have enjoyed reading this post and will try to make a glittered background of your own. I hope you will also make it your goal this year to try things using your eBrush. Thank you so much for starting our year out with this beautiful project! So many options for the techniques you shared! WOW!!! 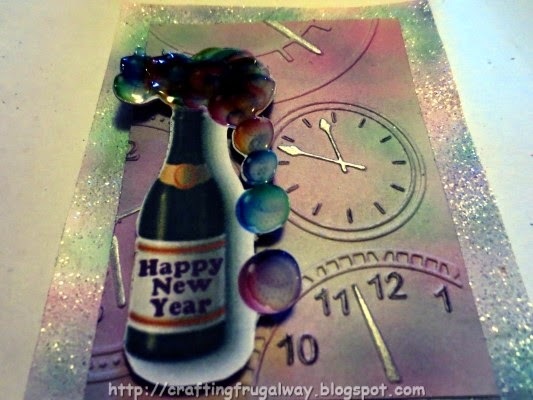 VERY creative, I love the hologram look of the glittered paper and the embossing folder you used. The eBrush is so much fun to use and you can make your own stencils making it a wonderful value. Congratulations on your guest post, Beth. I loved your tutorial. Your card is so adorable. Way to go girl !! A great big congratulations and you did a lovely job. So happy for you and I hope you achieve your goal of being on a design team.